When I first read about transient shaper, I was like “what’s the difference with a compressor? Is there one?”. And I tried to see how to get these transient without relying on the transient energy, with a relative power (ratio between the instant power and the mean power) filter, or its derivative, but nothing worked. 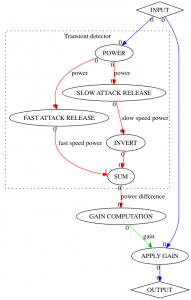 Until someone explained that the gain was driven by the difference between a fast attack filtered power and a slower one. So here it goes. I’ve surrounded the specific transient shaper part in with a dotted line. This is the difference with a compressor/limiter/expander: the way the signal steered the gain computation is generated. Let’s start from a kick. 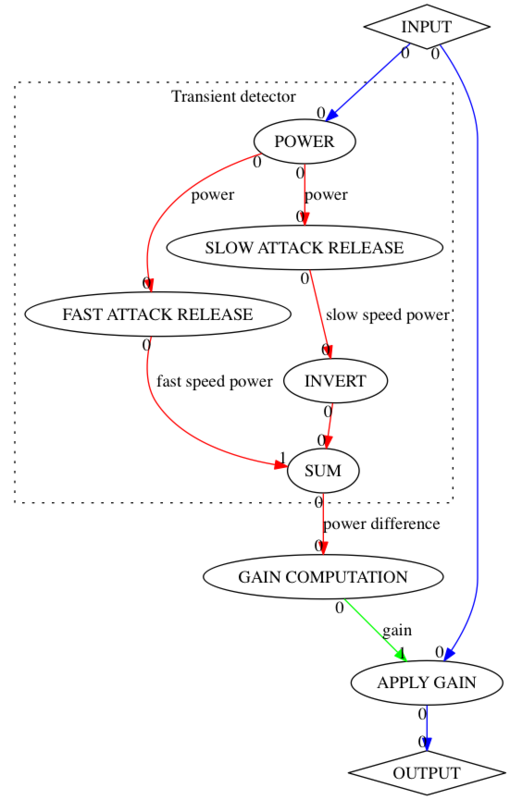 The fast envelope follower can then be generated (red curve) as well as the slow envelope follower (green curve). 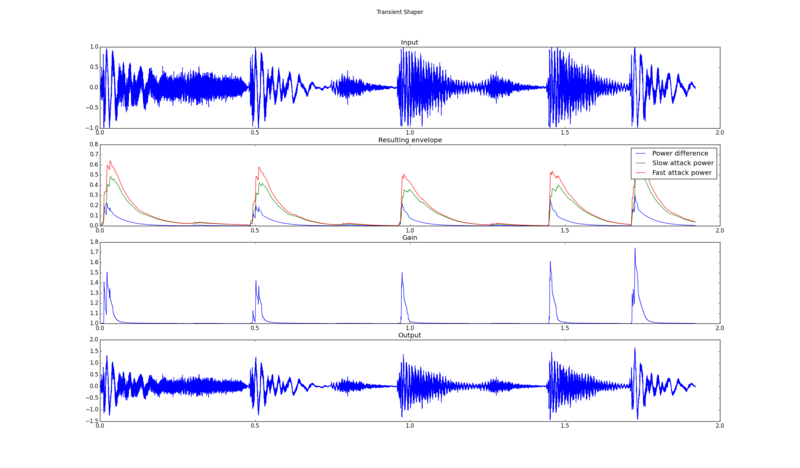 The difference is always positive (if the two follower have the same release time value), so we can use it to compute a gain through our usual GainCompressorFilter. In the end, it’s all about the right algorithms. If you have a proper framework, you may already have everything you need for some filters. In the case of a transient shaper, I already had all the filters in my toolbox. Now I just need to make a plugin out of this simple pipeline! I try to try your plugins but I don’t know how and where to download it…. Please note that the transient shaper is not released yet, but as it is quite similar to the compressor and that all the pieces are in ATK, I wanted to show how it would work. Nice Job !!! Thanks !